2 colours: black or grey. Constructed from ABS high impact plastic. 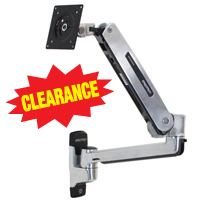 The Neo-Flex Monitor Arm from Ergotron offers a full 8" of height adjustment and can be used to position the middle of the monitor anywhere from 8" to almost 17" above the mounting point. 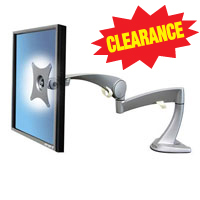 The manual "gear lock" elevation adjustment ensures that the monitor screen remains stable, especially valuable with touch screens. To enhance the viewing experience it also features tilt, pan, and rotation adjustments to fine tune the position to eliminate potential for glare from lighting. The Neo-Flex Monitor Arm can extend over 19" from the mounting point or can be folded back upon itself where less extension is require. An integrated cable clip keeps cables neatly contained. The LX Sit-Stand Wall Arm Monitor Mount from Ergotron is an ideal solution for workstations that need to be accessed by a range of users. With a full 20" range of readily available height adjustment the LX Sit-Stand Mount is able to meet the varying height requirements of the majority of users. 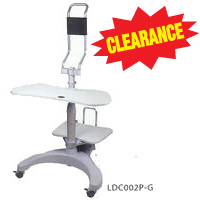 In addition, the extended reach of 33" and the multiple articulating joints enable users to position the monitor in to reposition the monitor with just a touch (up, down, forward, and back), providing unparalleled range of motion. Because of the wide range of height adjustment and the ease of movement this monitor mount is a good candidate for locations where monitors will be viewed from a standing position.